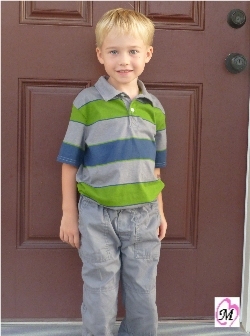 This week was another milestone in our family…the start of 1st grade for my oldest. My son was starting 1st grade at a new school that was just built near our community and although he appeared a little nervous the week before at meet the teacher day…on the first day of school he told me, “Mom, you can wait in the driveway. I will walk to the bus stop myself.” Quite a change from last year with his very hesitant (almost sad) eyes peering out at me when he got on the school bus for the first time. I have very mixed feelings about letting him walk to the bus stop by himself. We are only a few houses away so I can clearly see him but it is just another milestone of my baby boy taking another step toward independence. No matter how many more steps he takes or (giant leaps) he will always be my baby boy. Congratulations my 1st Grader! I’m very proud of you!! ← New Nursing / Burp Cover Now Patented!